What does a petroleum pump system operator do? Would you make a good petroleum pump system operator? Take our career test to find out how you match with this and over 800 other careers. What is a Petroleum Pump System Operator? What is the workplace of a Petroleum Pump System Operator like? Petroleum, or oil, has been utilized since prehistoric times and is an essential resource which is used daily in most parts of the world. 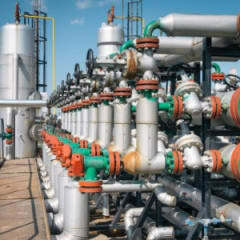 A petroleum pump system operator is someone who sets up, tends, operates and controls petroleum refining units at a petroleum refinery or a large ship pumping station. An oil refinery is a facility where crude oil is broken down and then recombined into such products as gasoline and jet fuel, and so it is a massive maze of pipelines and chambers. A petroleum pump system operator signals other workers, by phone or radio, to operate pumps, open and close valves, check temperatures, pressures, and flow rates. Control rooms are now highly automated, and operators are required to record operational data, such as products and quantities pumped, timings, gauging results, and stocks used. Petroleum pump system operators use hand wheels to open line valves and direct the flow of products (controls have to be moved to exact positions). Another key aspect of the job is starting the batteries of pumps and observing pressure meters and flowmeters. Objects need to be installed and moved, and considerable body movement is required for this job, with much stooping, walking, balancing, lifting, and climbing, so agility is required. Operators receive schedules and instructions from the dispatcher. They synchronize operations with other pump houses to make the flow of products continuous and minimize contamination. They liaise with technical personnel to research and resolve problems (immediate action is often required). Research often takes the form of inspecting equipment, materials, and structures. Computers are used to direct processes, events have to be monitored, electrical and mechanical equipment has to be maintained, and any information is recorded in written or electromagnetic form. Are you suited to be a petroleum pump system operator? Petroleum pump system operators have distinct personalities. They tend to be realistic individuals, which means they’re independent, stable, persistent, genuine, practical, and thrifty. They like tasks that are tactile, physical, athletic, or mechanical. Some of them are also conventional, meaning they’re conscientious and conservative. Does this sound like you? Take our free career test to find out if becoming a petroleum pump system operator is right for you. A petroleum pump system operator works at a petroleum refinery or a large ship pumping station. The job can be dangerous as operators are often required to deal with hazardous materials.